On the third Tuesday of each month from September thru May, the Mycological Society of San Francisco has a General Meeting at the Randall Museum. The highlight of each meeting is a speaker with slides on some aspect of mycology and mushrooming: ecology, taxonomy, mycophagy, sociology, etc. Before each meeting members bring collections which are put on display and identified. Refreshments are served before the meeting. Doors open and identification starts at 7 pm. Note: All regular General Meetings are open to the public. Some meetings have reserved seating or may have an admission fee for non-members. 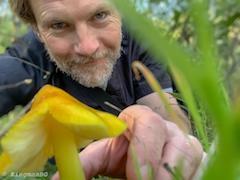 Hunting By Habitat: I will be discussing common and less common edible fungi found in urban environments like parks and residential zones to the coast to the Sierra. My talk is geared towards beginners but seasoned mushroomers will also enjoy my presentation. Kingman Bond-Graham discovered the incredibly vast world of fungi at the age of 10. While playing on his family property in Mendocino County, he noticed thousands of mushrooms. After crafting a science project for school, he continued with his fungi fascination into adulthood. Kingman has been collecting and studying the mushrooms of Sonoma, Mendocino, and Marin Counties for most of his life. His interest is both culinary and scientific. He will discuss when, where, and how to look for mushrooms and what to do with mushrooms when you find them. He will emphasize how citizen scientists can contribute to the world of mycology through their hobby. Kingman is an active member of the Sonoma County Mycological Association and can be found at all club events and meetings. He has served on the Board of Directors for the past two years and President of Sonoma County Mycological Association.